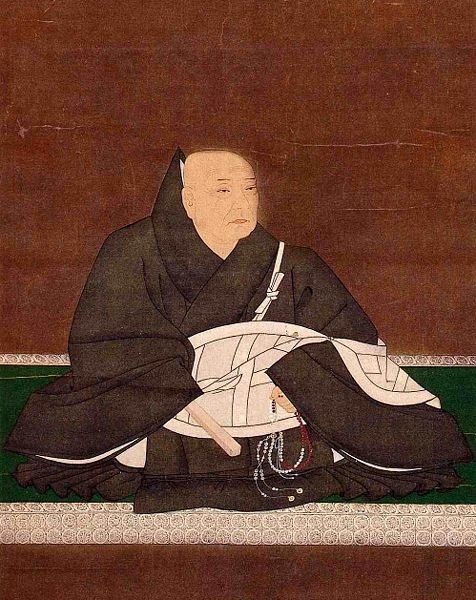 Rennyo (1415-1499) was a descendant of Shinran and the eighth chief abbot (monshu) of the Hongwanji in Kyoto. He was called Hoteimaru in his childhood and, later, was named Kenju. When he was six, his mother—a maid serving Zonnyo, the seventh chief abbot—left him to live in obscurity. When he was 17, he received his ordination from Sonnō at the Shōren-in Temple. While studying the teaching of Jōdo Shinshū from his father, he assisted him in spreading the Dharma in Omi Province (present-day Shiga Prefecture)and Northern Japan. In 1457, when he was 43, he became the chief abbot and continued his missionary activity in the Omi region. Displeased with the growing popularity of Rennyo's movement, the warrior-monks of the Enryakuji Temple on Mt. Hiei attacked and destroyed the Hongwanji in 1465, so he moved to Kawachi (eastern part of Osaka Prefecture) and then to Omi Province. In 1471, he built a temple, a new centre of his activity, in Yoshizaki in Echizen Province (present-day Fukui Prefecture), and succeeded in attracting a large number of followers. He started a unique way of transmitting the Dharma through the use of letters, which were widely read among the followers and contributed enormously to the dissemination of the teaching throughout the country, even among the illiterate. The growth of Shin Buddhism in Northern Japan, however, often created troubles with local manor lords and governors, culminating in the "ikkō ikki uprisings" of Echizen, Kaga, and Etchu Provinces. In order to avoid further conflicts, Rennyo withdrew from Yoshizaki in 1475 and moved the center of his activity to the Osaka-Kyoto area. At the suggestion of his disciple, Dōsai (1399-1488), he acquired a large estate in Yamashina, east of Kyoto, where he built the Founder's Hall (1480), the Amida Hall (1481), and the main gate (1482) thus consolidating the foundation of the new Honganji headquarters. Shinran's statue that had been placed in the care of the Miidera Temple, was properly deposited at the Founder's Hall after fifteen years. The precincts were surrounded by ditches and lines of massive pine trees. Greatly satisfied with the outcome, Rennyo called this base for Buddhist activity 'Shōrinzan Honganji' ('Pine Forest Honganji'), which came to be known as Yamashina Honganji. Unfortunately, in 1532 at the time of Shōnyo (1516-15549), all the precinct buildings were burnt to ashes by Nichiren followers. In 1489, Rennyo retired as the chief abbot, leaving the position to his fifth son, Jitsunyo. With an undiminished missionary spirit, he built a temple in Ishiyama, Osaka, in 1496—at the site where the Osaka Castle now stands—and spent the rest of his life there. When he became ill in 1498, he returned to Yamashina, where he passed away the following year at the age of 85. Later, in 1882, the Emperor Meiji awarded Rennyo the posthumous title Etō Daishi ('Master of the Lamp of Wisdom'). At the height of his missionary activity, Rennyo edited and published the Shōshinge and Jōdo Wasan as the standard service book for everyone to use. With the addition of the Letters, this form of service has continued to be held daily in every Jōdo Shinshū household and temple. As a guide for correct understanding of the Shōshinge, Rennyo wrote An Outline of the Shōshinge. His Dharma-messages, casual remarks, and the record of his day-to-day activity were later compiled by Jitsugo and others. As a method of spreading the teaching to the masses, Rennyo painted a great number of myōgō (Amida's Name as the main object of veneration). Besides the six-character name (rokuji myōgō), he liked to paint what is called mugekō honzon, using the ten-character Name (jūji myōgō) as the main object of veneration.